What’s Big and Green…and Friendly? Home / What’s Big and Green…and Friendly? The Former Governors’ Mansion is 132 years old. As a former residence, one thing is certain: many children have played in the attic playroom, frolicked on the spacious lawn, and enjoyed singing or playing the piano in the parlor. In fact, many phases of restoration have revealed marbles, play money, and even height marks scribbled on walls. At first glance, “play” today and yesterday may look quite different; try to find a child who isn’t engrossed in a video game or on some device. But there are similarities. In addition to Angry Birds, children still enjoy marbles, storytelling, singing, and bean bag toss on the lawn. We are thrilled to share our increased focus on programming for young children. With my background as an educator and children’s entertainer, I have enjoyed supplementing the already diverse programming at this state historic site with weekly and annual activities for children. For example, we have added Friday lawn games and music at noon during the summer, an annual Flag Day parade and flag making, kite making and flying, Dinosaur Day and other events. When “Fun Friday” began in June 2015, we hosted over 240 people that month just for a one-hour weekly event. 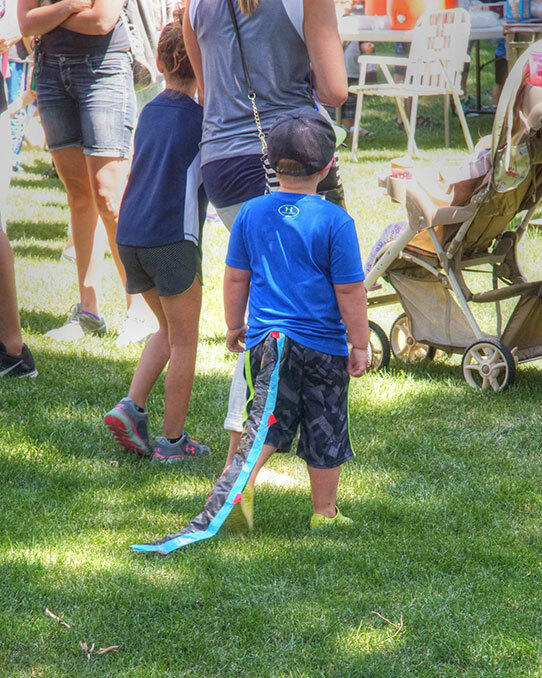 We recently added Dinosaur Day; over 450 people came. The following day—Fun Friday—welcomed 61 more people. Though there is some preparation involved, those two events lasted a total of 3-3.5 hours. That’s more than 500 people in less than 24 hours for three hours of programming at a fairly small site in the heart of downtown Bismarck! High visitation numbers make everyone who works in our field happy. But no one works at a historic site just to rack up numbers. While historic sites offer much to learn or uncover, they also offer an abundance of something else: heart. We all have memories that make us happy, and the work of restoring, preserving, creating, and promoting memories (with a site) is what we do—even if they aren’t our own memories! Here’s the secret: Memories don’t belong to only yesterday. At the risk of sounding like a bad pop song, memories are created constantly within us. To learn something new and establish something in one’s memory, the new stuff coming in has to latch onto something already “there.” If it doesn’t, it’s gone because it wasn’t assigned meaning to us while it lived for a few seconds in our minds. Back to the Mansion. A large, green, somewhat daunting house that has the word “governor” in its description carries no real meaning to a young child—unless we attempt to give it meaning. If we can do this successfully, the child creates a memory. That’s where we come in. Think back to a place you loved to visit as a child. There! Did you feel that? 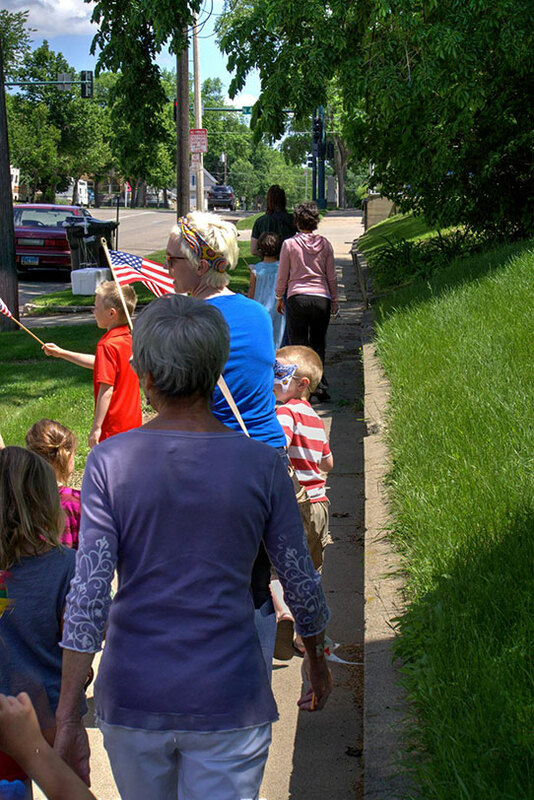 The “Ah, yes—that takes me back” feeling that warms the heart is why I am compelled to invite kids to sing on the west lawn stage every Friday at noon…or blow a toy trumpet in our Flag Day parade…or color homemade kites for Kite Day. We hope to inspire children at our events, and they will experience that warm feeling about our beloved Mansion and grounds. But this is no “Field of Dreams,” where we simply build it and expect them to come. Planning is fun, but spreading the word is multi-layered. Parents with young children are now “digital natives”—they grew up with social media and computers or phones, and this is where they get much of their information. An event can be seen and shared by thousands of people in a short time—like with Dinosaur Day. And when parents do come and see their child on stage singing in front of 50-100 people, you should see the phones start recording! The big, green, friendly mansion is the backdrop of film clips and photos sent all over the world to family and friends. This site in the center of town is dignified, stately, and grand. We hope tomorrow’s adults also look at the Mansion with a warm feeling that comes with loving a special place filled with memories in the heart of their community.